This summary is on a forthcoming article in American Scientist (Vol. 100, No. 4, pg 334-341). The text-only version of the article is available here at the arXiv. Every now and then, something amazing happens in observational astronomy that changes everything. It doesn’t happen often, but when it does fantastic things happen: entire paradigms change; new discoveries are made at an incredible pace; we quickly realize how much we never knew, and how much we thought we knew, but didn’t. The Hubble Space Telescope is a great example of what I’m talking about. The telescope was a revolutionary tool that allowed humanity to stare deeper into the cosmos than ever before, to see things we never knew existed. The Hubble Deep Field and Ultra Deep Field images showed us that even a seemingly dark patch of sky was in fact teeming with thousands of ancient galaxies. From it, we’ve learned much about our universe and our place in it. Well, it’s happening again. The Kepler Observatory, launched in early 2009, is the next big thing. 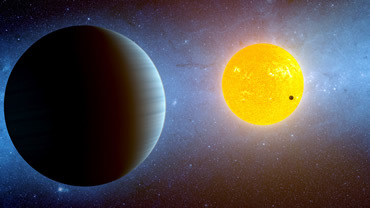 Its bold mission is to detect and characterize extrasolar planets (exoplanets for short)–planets that orbit other stars. Immediately after its launch it got to work and produced incredible results. To date, Kepler has discovered over 2,300 potential exoplanets, 61 of which have been confirmed. Kepler finds exoplanets by looking at the so-called transit light curve of a star. As a planet passes between its star and us, the brightness of the star decreases ever so slightly, creating a dip in the light curve. Kepler also examines how a star wobbles due to the planet’s influence. Combining this information, one can determine the size, mass and orbital period of the planet in question. Unfortunately, it’s difficult to extract more information about planets because they’re so close to their star that they are not currently resolvable. That hasn’t stopped some astronomers though, who are utilizing clever tricks to uncover some incredibly detailed spatial information about these exoplanets. We are now leaping into the age of exoplanetary cartography! 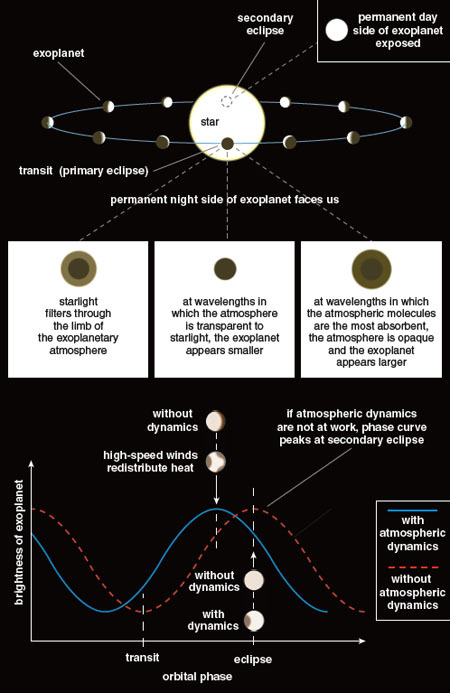 This is possible because we have the ability to measure the dimming of the light as a planet passes behind its star–called a secondary eclipse (Fig. 1). An incredible feat, indeed! When this happens, all that can be seen is the light from the star, since the planet is blocked. 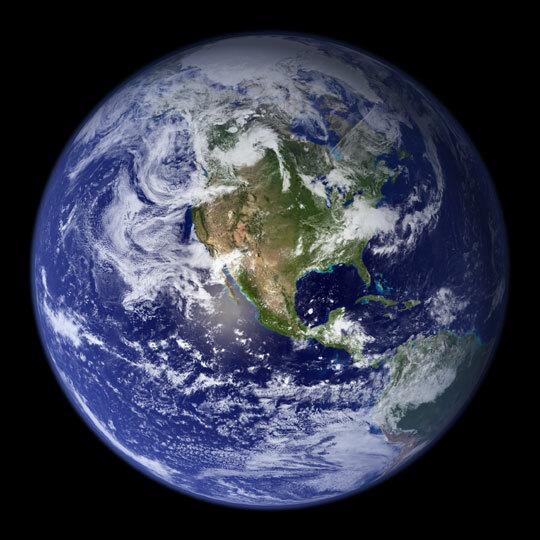 Once the planet is no longer blocked, one can subtract out the light from the star alone, leaving only the light being reflected by the planet and its atmosphere (if it has one). 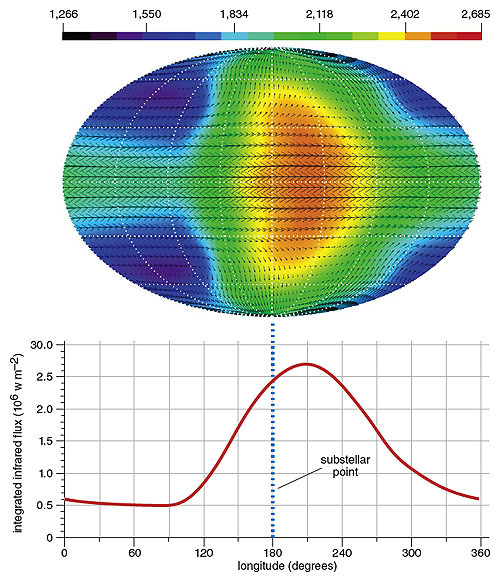 Being able to detect the light from the exoplanet is quite noteworthy, since it allows astronomers to obtain spectra over a variety of wavelengths to determine chemical composition and abundances. They can also examine how the planet’s brightness changes as it moves around the star and create a “brightness map” of the planet using a special inversion technique (Fig. 2). Figure 2: Brightness maps. The top two stills are computer simulations for Earth-like planets. The bottom two are inferred values for a hot Jupiter planet. Surface heating by a star is the driving force for weather. So understanding the brightness map naturally leads to understanding basic weather patterns on the exoplanet. To keep it simple, astronomers have focused on what are known as hot Jupiters—planets that are similar to Jupiter in size, but are much closer to their star. Their surface temperatures generally range between 1,000 and 3,000 Kelvin. They are thought to be similar in composition to the nebula they formed from, which makes them easier to observe than something more complex like the Earth. Their proximity to their star produces an interesting effect known as tidal locking. This means that the planet is spin-synchronized with its orbit around the star (like the Moon with the Earth); one side of the planet always faces the star and one side always faces away. In other words, the planet’s year is the same length as its day. This creates an enormous temperature gradient between the day-side and night-side of the planet which probably produces fast-moving winds. These winds can be inferred by measurement. If you look at the light curve for the planet you’d expect it to be sinusoidal, being the brightest during secondary eclipse and being dimmest during transit. However, horizontal winds on the planet will transport heat from the day-side to the night-side, causing this curve to shift. Indeed that shift has been measured, which shows there are horizontal winds present. But why stop there? Astronomers using the European Very Large Telescope (VLT) have managed to use absorption spectroscopy to measure the velocity of these winds. By measuring the shift in wavelength of carbon monoxide absorption lines, they’ve been able to clock the wind speeds at nearly 2 km/s (about 100 times faster than winds on Earth). 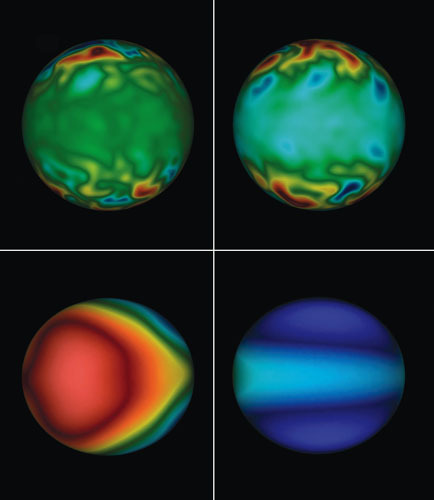 Figure 3: A simulated temperature and wind map for the atmosphere of a hot Jupiter (top). A latitudinally averaged brightness map showcases the shift of the peak due to winds that transport heat from the day-side to the night-side (bottom). This is a truly remarkable feat. All it took was the launch of a new telescope and humanity is now diving into the realm of meteorology outside of our solar system. So far, we can only infer the most basic weather patterns, but the techniques are being improved all the time and this exciting field will surely progress. The Colors of a Second Earth Kepler-10c: A Newly Validated Kepler Planet in a Multiple System Optimizing the search for pale blue dots Astrobites: A Look back at 2016! interesting subject.. looking forward to listen more.